We have all heard it said that one’s garden should be a like a series of outdoor rooms unfolding one after another as one explores and wanders about. This succinct succession of experiences is essential to providing interest and excitement in not only the garden but in a home as well. Done right, each individual space works towards the creation of the overall feeling of a property or space. But what about the spaces that occur even before encountering the garden proper? The house becomes also an element in this experience – as does the entry, the drive, and yes, even the road leading to the house and the quality of the experience beyond. How was your flight? Henry David Thoreau had it right when talking about the concept of wilderness – without the notion of a place apart, the world would be a different place. The mere fact that one knows wilderness exists is enough to change the way we think about the world. In a similar way, places such as Sun Valley provide the missing element to those that make it a home on a temporary basis. The mere knowledge that the Valley exists makes and changes those life experiences one has while apart from the direct experience. The idea of Sun Valley becomes just as important year round to the visitor as does actually experiencing and spending time in the valley. In a similar way, the details of the garden work silently to convey the sense of place. They in effect act as hidden rooms and places within the garden that add up together with our other non-garden experiences to create the entire garden experience; the parts of the garden add up to create something that is something completely other than the whole. Recently we have been working a lot with metal, concrete and wooden forms to act as structural counterpoints to the wild and uncontrolled nature that surrounds the Sun Valley area. 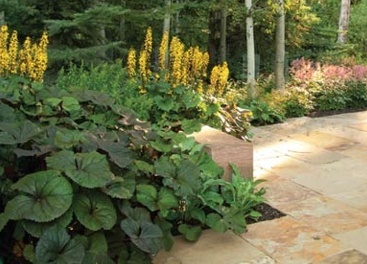 This is not unlike the notion of the original French Gardens and ancient Japanese gardens that strove to carve out structure and control out of the plant material and landscapes that they inhabited. Here the control of forms creates a gestalic statement that allows one to not only see the forms of the garden but the forms and presence of nature as well. Many of these forms take clues from Nature. The mass and angular forms of a concrete bench echo the feel of boulders in a canyon. A panel of simple color provides a mirror to the peace of the blue sky; a row of trees with a simple groundcover allow one to sense the simplicity that nature offers without trying to recreate that nature itself. By making forms that allow one to better see and experience what nature inherently brings us we can do better than simply trying to recreate that nature itself, for the feel of nature requires the context of our experiencing it in order to be at its best. One cannot see wilderness without a context to see that wilderness in, and one cannot see color were it not for the other colors around it. I encourage everyone sit and see the contrasts that make our lives so varied and interesting, ideally while sitting in a beautiful garden.